Old school online newsletter Checkpoint from Tagesspiegel in Berlin wins Grimme Online Award 2015. Here is why it is well deserved. The Tagesspiegel has a daily circulation of 110`000. The newsletter that its editor-in-chief Lorenz Maroldt produces each weekday morning before 6 am has a quickly growing daily circulation of more than 90`000 (corrected 07-15-15). Key to the success is an old school mix of content in an old school online format: the newsletter. A nosy, outspoken, witty view on the politics of Berlin. An outlook on what happens at the court and on the streets of Berlin today. Intermingled with daily cultural hints (last performance next week, exhibition closes), combined with draws (we give away tickets or a reservation to a fancy restaurant). The mixture should allow readers to start the day with a “knowing smile” the editor-in-chief explains. And it does. Lorenz Maroldt uses a no nonsense tone and a sharpness in his newsletter that is not to be found in the printed paper. The growing circulation makes his voice better heard every day and it becomes for any politician in Berlin less and less attractive to be attractive to Maroldt. The success of the online newsletter very likely will spill over. Branding is done by sharpening the publishers profile. 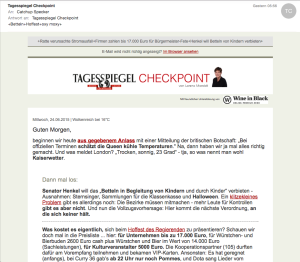 Checkpoint definitely is helping Tagesspiegel to gain in status again. Rediscovering core journalistic values in the subjectively less controlled and public online space and then bringing these core values to all channels. For many Berliner the day starts with checkpoint and it shapes its course. A model worth studying. Coincidence that #rafat and #dangillmor today refer to another old school newsletter as “brilliant curation” or better still “break out media company of the year”? Check theSkimm.